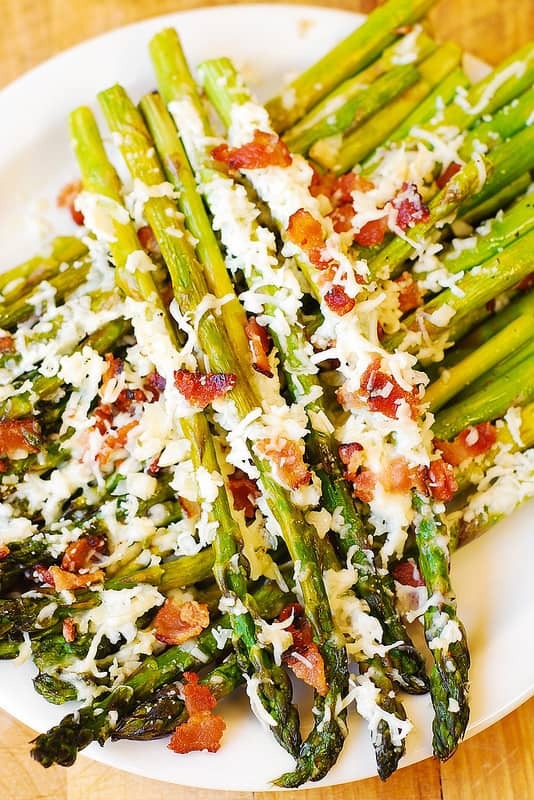 Oven-Roasted Asparagus with Bacon, Garlic, and Asiago cheese – perfect appetizer for all kinds of meat and fish. Healthy, gluten free, low-carb, KETO friendly. This recipe provides detailed instructions on how to roast the asparagus in the oven so that it has perfect texture. 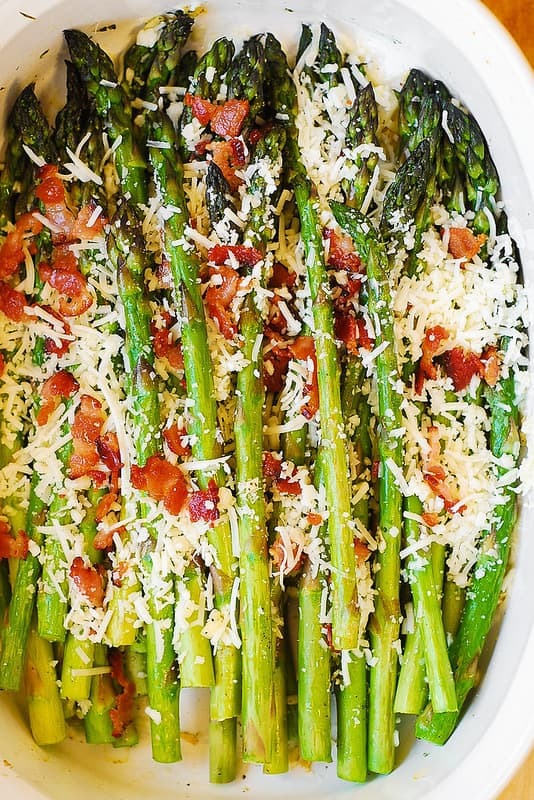 Garlic, bacon, and Asiago cheese make this asparagus an absolute comfort food! The recipe is easy and quick. It takes only 30 minutes from start to finish, including the roasting time! Healthy, low-carb, gluten free, KETO friendly recipe. Great as a side dish to any kinds of meat; it also makes a great breakfast along with scrambled or poached eggs. 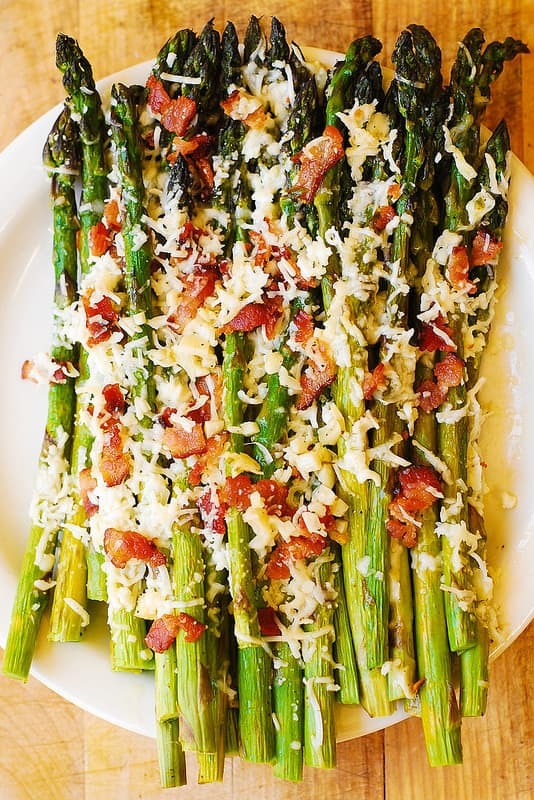 Oven-roasted asparagus has an amazing texture: crispy and crunchy – you’ll love the Asiago cheese and bacon combination! Asparagus is the ultimate low-carb vegetable, perfect for KETO diet. Read this article discussing the carb content of asparagus for more information. Other add-on ingredients in this recipe are all KETO friendly: bacon, Asiago cheese, and olive oil. These are all low-carb, high-fat, low-sugar ingredients. Roast the asparagus in the oven or grill it? I was never a fan of grilling asparagus on a grill, as it often gets burned all over and you have to watch it really carefully to make sure the asparagus doesn’t get burned. Try this recipe for oven-roasted asparagus instead, as an alternative to grilling, and you will appreciate the perfect texture of roasted asparagus. The secret is to roast the asparagus in the oven just at the right temperature, which is 425 F. The cooking time is very important too. Roast the asparagus for 20 minutes total. Uncovered. And, you’ll never grill the asparagus again. Your asparagus will be nice and crunchy and crispy and not overcooked. 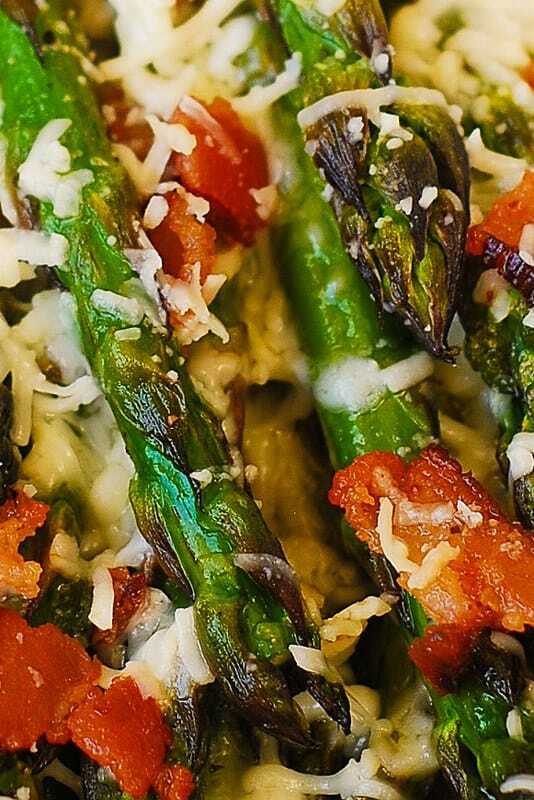 What you have in the end is perfectly crisp and crunchy asparagus, with melted cheese and bacon. So good! 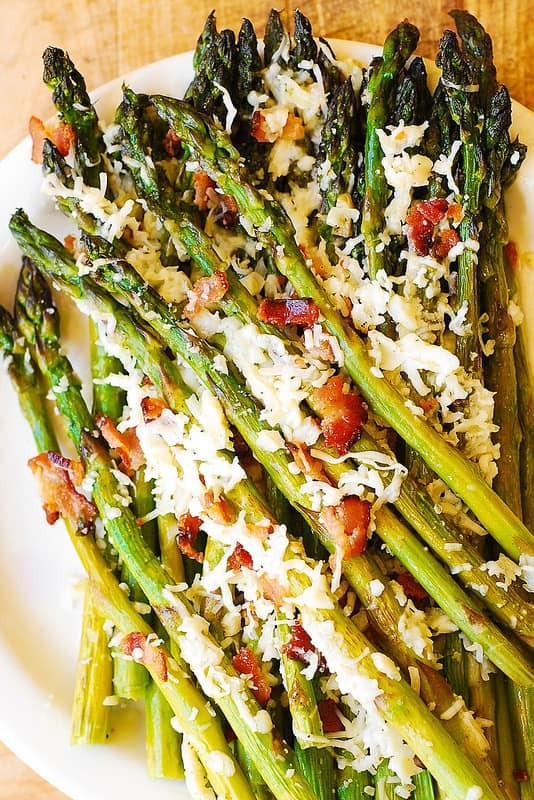 Oven-Roasted Asparagus with Bacon, Garlic, and Asiago cheese - perfect appetizer for all kinds of meat and fish. Healthy, gluten free, low-carb, KETO friendly. Asparagus will have a perfect texture: crispy and crunchy, without burning or overcooking. This recipe is a fantastic alternative to grilling. Preheat oven to 425 F. Trim asparagus ends. 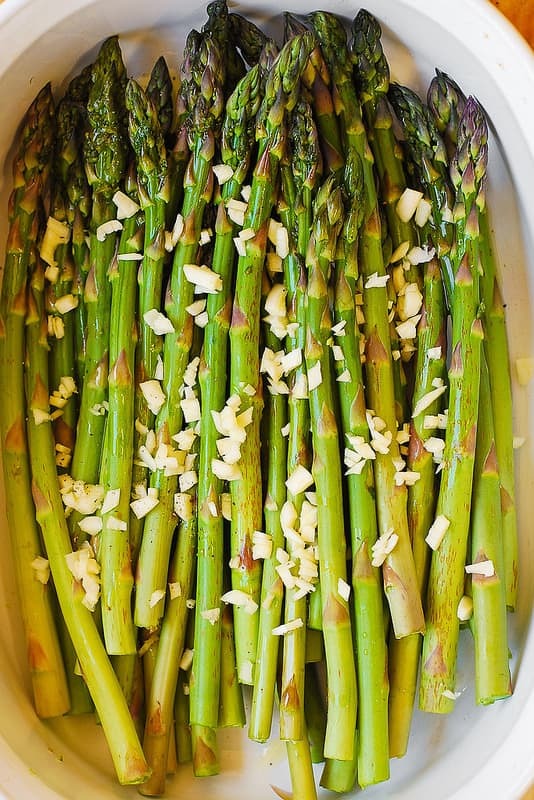 Place asparagus in a 2.5 quart casserole dish, drizzle with 2 tablespoons of olive oil, season with salt and pepper, mix everything well. Mix in the minced garlic. Roast, uncovered, at 425 F for 10 minutes. 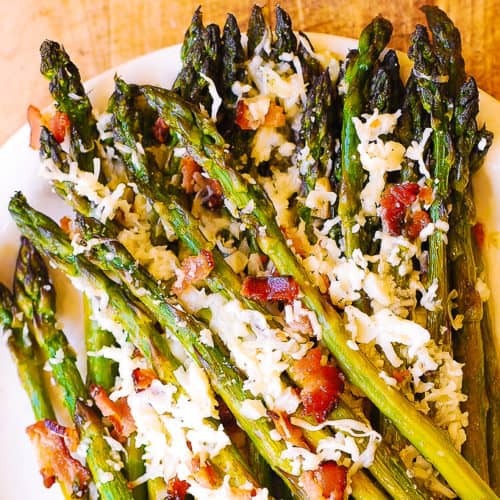 Sprinkle half of shredded Asiago cheese all over asparagus, then add chopped cooked bacon, then top with the remaining half of shredded Asiago cheese. Roast for 10 more minutes, uncovered at 425 F. Asparagus should be crispy and crunchy. I made this for Christmas dinner. Easy to make. I substituted with cooked prosciutto only because I forgot to buy bacon. Everyone loved it! Thank you. Delicious! 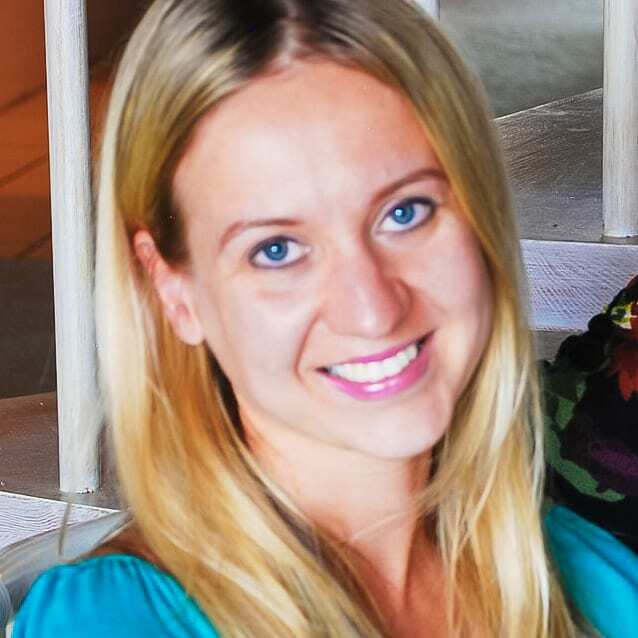 Robin, I am so glad you enjoyed this recipe! Using prosciutto is a great idea! Love it! Can I make this ahead of time and heat when ready to eat? Yes, you can reheat it later. Best to reheat it in the oven. Could I use Parmesan or mozzarella instead of Asiago? had this with steak on new year’s eve. excellent – beautiful and tasty! it was especially good with some balsamic glaze on it. Kathleen, so glad you liked it! What a great choice – to serve this side dish with steak! Balsamic glaze on top sounds interesting. Julia, this looks amazing, I can’t wait to try it! Look at the cheese and those gorgeous asparagus! Now, this is a dish I could make every week! Can’t wait to make this! Look at the cheese and those gorgeous asparagus! Now, this is a dish I could make every week!